I just checked Amazon, and sure enough, Beloved Distance is now available for purchase there. Just a reminder, the eBook will be available for download through the rest of today (Eastern Time). As the rest of the world churns over last night’s political spectacles, I settle into my day and get ready to take care of business. After 1/31/18, Beloved Distance will be available for purchase in Kindle format and also in print. We live in a world on fire. Everywhere we turn, there’s discord, strife, violence. It feels like everything is falling apart, and the global suffering never seems to end. Some say, we must eradicate separation and experience Unity, in order to step back from the brink of destruction. We must come together As One, and embrace a sense of universal connection. The only problem is, separation is central to our human experience. We are separate beings, distinct from each other. And we constantly seek to distinguish ourselves from others, as part of our community-building work. 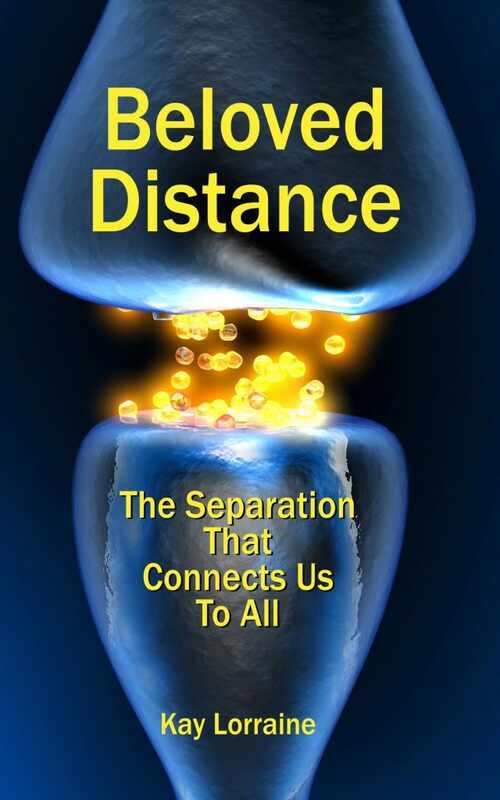 This book explores how we can embrace separation and distance as a vital part of our human lives. It asks us to look within – to the very structure of our cells – to find answers… and ultimately meaning… in the way we’re built, and the way we are built to connect. Separation is what we are. Connection is what we do. Join this journey into the innermost workings of the amazing human body, and let it change your ideas about the outermost workings of the human species. Printed on-demand, takes 5-10 days for delivery. This weekend has turned out to be another full one (and I’m flying to Austin, next weekend, so there’s another weekend… consumed. So, I’m making the most of my time. I’m still waiting for the print proof copies to show up (tho’ they might be waiting for me down at the garage, if FedEx showed up today – I’ll have to go check). In the meantime, I’ve prepped the eBook version, and that is ready to go on Wednesday. I’ll be offering free copies of the eBook on publication day (Wednesday, January 17), as well as opening up to purchase. Folks who want print copies will be able to order on Wednesday, as well. It’s just going to take a week or two for them to arrive, since the first print run has yet to go, and fulfillment takes time. But nonetheless, Beloved Distance will be available this coming Wednesday, January 17, 2018, as planned. And once the production details are all settled and the book is in circulation, the in-depth discussions shall commence. P.S. If you’d like a review copy, please comment below. Specify print or digital. And if you’d like to chat about Beloved Distance on your radio show or podcast, feel free to reach out to me, as well. Would love to talk! Why write? Why think? … Why not? I’ve always gotten in trouble for thinking the way I do. Not necessarily for specific thoughts I’ve had, but the manner in which I think. While some people think / philosophize / study in order to master a subject, establish their expertise, or carve out a corner of the intellectual landscape as their own, I think to explore. Life is absolutely fascinating, and there’s so much to dig into… connecting the dots… seeing the correspondences… finding out what leads to what and what else is on the horizon. Frankly, I’m more interested in asking interesting questions — with or without decent answers — than I am in reaching definitive conclusions. And that’s true, all across the board. It gets me in trouble. It always has. And it’s probably not going to stop, anytime soon. Some of my most dramatic troubles used to happen with a guy who’s now one of the up-and-coming stars of American philosophy. He’s published a number of books and a bunch of papers, and he was invited as a guest lecturer at a British university not so long ago. He’s apparently a pretty big deal in certain circles, and I’m really happy for him. The last time I saw him was about 10 years ago, and he was amiable — a lot more amiable than I was expecting, actually. See, he and I used to really go ’round. Our families were connected, and we ended up in each others’ orbits repeatedly. On good days, we had some amazing discussions. We could talk about just about anything, and when we were on the same wavelength, our exchanges were some of the most invigorating I can ever remember having. On the other hand, if we were out of sync, he had a bad habit of attacking me. He’d get really intellectually aggressive, pressing me on points, not giving me much room to think… even physically attacking me on several occasions. Of course we were something like 8 or 9 years old, at the time. Back in the day, it didn’t seem like that big of a deal when we kids scuffled. I often tussled with other kids — from the neighborhood or my own family. It was just one of those things we did. But the scuffling that happened with my philosophical compadre was… different. It didn’t seem to happen just because he wanted to horse around. It felt more like it was a direct physical attempt to dominate me, to put me in my place, to establish superiority over me, when intellectual attempts fell flat. If my self-created rival (who I always thought of as a friend) couldn’t win his point with words — because he was arguing to win, whereas I was thinking out loud to explore, and there really was nothing to win — he’d use his larger size and heavier weight to overpower me. Supposedly, he nearly killed me, once… according to my mother. She said something about him trapping me in a closed space where I could have smothered? I have a faint recollection of that, but it was really just one in an extended series of attacks from him. He’s famous, now. He’s got a wife and kids, and he’s all set. I’m happy for him. I’m also happy I’ve gone my own way. Far from that counter-productive sort of exchange, where there have to be intellectual winners, there have to be losers, and anyone who doesn’t participate isn’t worth the breath of arguing with them. To be honest, I don’t have much use for that approach. I understand how people can be into it. I understand the draw. I’m just not interested, myself. I’d much rather find a meaty problem and dig into it, exploring all the nooks and crannies, ruminating, marinating, celebrating the intricacies of life on earth. A wide open world where there are no absolutes doesn’t intimidate me. It invigorates me. I figure, I’ll find out in the end… or not. Either way, it’s just how life rolls. And life should be free to roll. No necessarily in ways that flatten others without regard for their well-being (because that would impact my well-being in turn), but in ways that widen the world and expand our options. In ways that add meaning to life and flesh out our purpose, that shine a little more light into the corners of our experience that often go unnoticed or undervalued. We’re learning so much more about neuroanatomy, so much more about biochemistry, so much more about how our “wiring” works — that electrical / chemical network that helps make us who and what we are. The whole point of thinking and writing and publishing, for me, is to expand. My mind is pretty open, but it could be even moreso. My options are pretty extensive, but wouldn’t it be interesting to find out what else is out there? My understanding of life is finite and human, but that doesn’t mean I can’t grow in all directions. There’s a whole lot else I’m interested in finding out, and thinking, writing, philosophizing, are just some of the ways I have at my disposal. So, why not use whatever tools and resources I have available, to see what else is out there?